Miss J’s prep teacher finished for maternity leave on Friday with her 3rd baby, a girl that is due in June. 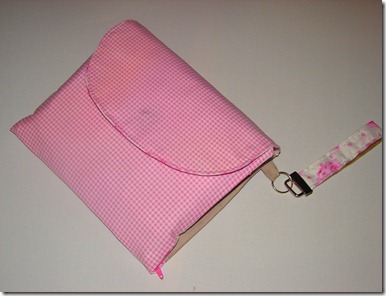 So I wanted to make her a clutch nappy wallet with a couple of changes made to it and I wanted it to be really girl. Well for something that should have only taken an hour I struggled with big time. My poor sewing machine is up for a much needed service I think. Not only did the bobbin play up and I had to re thread it twice, I also blew 2 light bulbs as well. The front was suppose to be have white with pink rose and half beige organic cotton fabric with a strip of crochet lace down the middle. 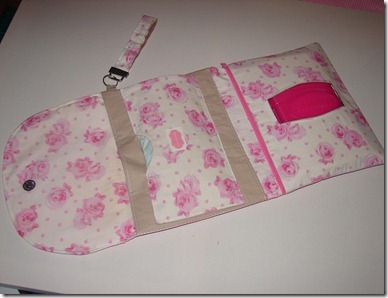 Because of the bobbin I had to unpick it a few times and when it was sewn all together it did not match up when folded. So back to the old drawing board and I decided to just change the fabric. 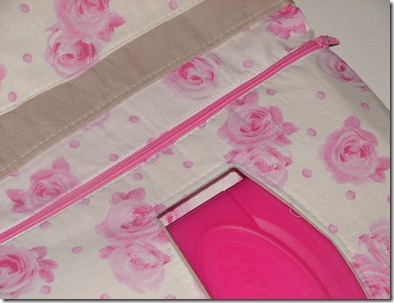 The one thing that did work for me was the zipper I inserted for the wipes container pocket. I think this is a great change and I will be doing this from now on with the rest of my wallets. In the end I think it turned out lovely and very girlie.